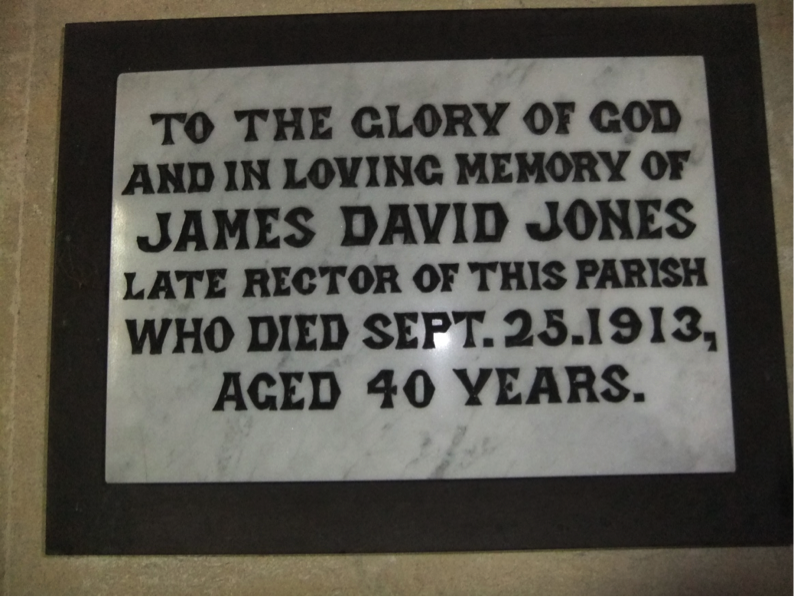 The Rev.James David Jones was appointed as Rector of Oddington in April 1904. His tenure was quite short and consequently little was recorded about him whilst he was at Oddington. James David Jones was born at Llanfair Orllwyn, Cardiganshire in 1872, the son of John, born 1847 and Hannah Jones (nee Evans), born 1833. The 1881 census shows the family living at Brynamlwg, Llanfair Orllwyn. John was a boot and shoe maker. There were five children – four girls and James David. The 1891 census records the family living at Berllan, Henlan, Cardiganshire. It appears that Margaret had died and John was now a hosier. All five children were still at home. The girls were all employed as stocking knitters and James was a student of theology. In 1903 James married Margaret Noble Jephson at Exeter. She was born at Bangalore, India in 1868. The 1871 census records her living at Stoke Cottage, Heavitree, Devon with her widowed mother Mary Hardin Jephson and her four sisters. Also living with the family was her grandmother, Mary Grain Noble. Margaret Jephson trained as a nurse at Charing Cross Hospital. On 9 February 1900 she enlisted as a Nursing Sister in the Princess Christians Army Nursing Service (Reserve) and served in the Boer War. The Testimonial letter dated 17 October 1903 to the Registrar of the Diocese Oxford states that Rev. Jones was Clerk of St. David’s College, Lampeter. The form had previously been made out in relation to a post at Passenham and Deanshanger, Northamptonshire. It is likely that Rev. Jones had been at this parish as letters from him to the Registrar in relation to the Oddington position came from “Harcroft”, Old Stratford, Stony Stratford, which is close to Passenham. Whilst living at Oddington Rectory, James and Margaret had two sons. The first, John Arthur Jephson Jones was born on 9 April 1904 and baptised at Oddington on 22 May 1904. The second, Robert Llewellyn Jephson Jones was born on 7 April 1905 and baptised at Oddington on 30 April 1905. The Parish Records record that his sponsors were R.H. Jephson, Esq., Rev. B.L. Jackson and Countess Beldimano. In September 1906 Rev. Jones was instituted to the living of Cardington, Shropshire. At the same time the previous vicar of Cardington, Rev. Thomas Lechmere Tudor Fitzjohn took up the post as rector of Oddington. In 1907 the third child of Rev. and Mrs Jones, Violet Mary Jephson Jones, was born at Cardington. On 23 September 1913 James David Jones died at Exeter at the age of 40 years. He is commemorated on a plaque in the chancel of the Church of St. Andrew, Oddington. John Arthur Jephson Jones was born at Oddington Rectory on 9 April 1904, the son of Rev. James David Jones and Margaret Noble Jones, nee Jephson. He was baptised at the Church of St. Andrew, Oddington on 22 May 1904. The family moved to Cardington, Shropshire in September 1906 when Rev. Jones took up the post of Vicar of that parish. The 1911 census records the family living at Carlton House, Denmark Road, Exeter. Rev. Jones died at Exeter in 1913. At the age of 19 John Jones embarked from Southampton aboard the SS Ohio, arriving at Ellis Island, New York on 3 July 1923. The Royal Fleet Auxiliary records his death on 11 June 1964, giving his rank as Chief Officer. Robert Llewellyn Jephson Jones was born at Oddington on 7 April 1905, the son of the Rector, Rev. James David Jones and Margaret Noble Jones, nee Jephson. He was baptised at the Church of St. Andrew, Oddington on 30 April 1905. His sponsors were R H Jephson, Esq., Rev. B L Jackson and Countess Beldimano. 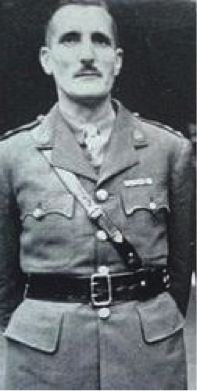 He entered Sandhurst in 1923 and in 1936 transferred to the R.A.O.C. Whilst serving in Malta in 1940 he was awarded the George Cross for courage in disarming a large number of unexploded shells. By the end of his military career he had achieved the rank of Brigadier. Brigadier Jones died at Ferndown on 27 October 1985.